ThinkGeek has conveniently organized their undead-related loot in one easy to browse location. Check it out if you're in need of brain-eating zombie fun for the holidays. Really, what says "Merry Christmas!" 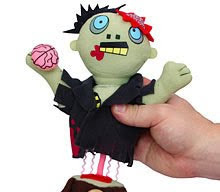 better than a Dismember-Me Plush Zombie?